Baby 20-year-old me on my first ever backpacking trip. 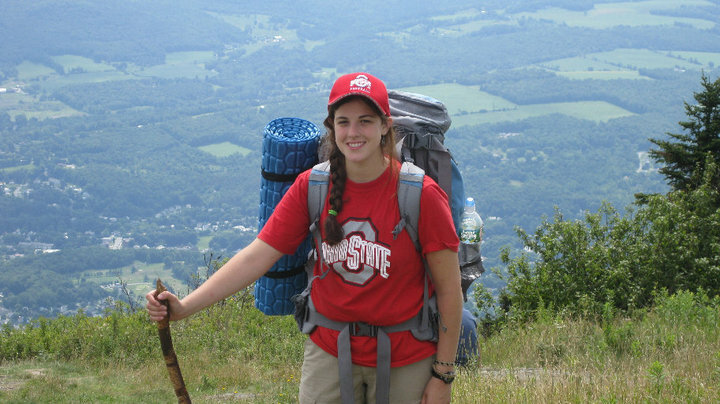 This was in Massachusetts on the Appalachian Trail in 2010, back when I rocked the side braid like it was my job. How many times have I thrown my pack down on the side of the trail wondering why I put myself through the torture that is long-distance hiking? Too many to count. As much as I love the wilderness, there’s no doubt that hiking over mountains while carrying everything needed for survival is f-ing hard. I’ve quit jobs (yes, multiple jobs), broken up with boyfriends (yes, multiple boyfriends), spent thousands of dollars on plane tickets and hiking gear, fallen ill with altitude sickness, been on the verge of hypothermia, and lost a few toenails all the name of hiking. If it wasn’t worthwhile I wouldn’t do it, and if it was easy it wouldn’t be worthwhile. I’ll admit that I’m probably the worst blogger in the world. Emails go un-replied. I won’t post on Instagram for weeks. I recently broke my phone and didn’t get a new one for a month. And I think all of that is OK. Nothing feels like a bigger waste of time than when an hour disappears while I’m staring at my phone not actually achieving anything. I disconnect by going out to the desert or mountains and hiking in places where there is no cell phone service. I’ve been trying to commit places to my memory sometimes instead of just taking a photo because what difference does it really make if I have one more landscape photo in my collection of hundreds of landscape photos? What do I achieve by making an effort to spend less time using technology? I feel more connected to the physical space around me, the people I’m with, and myself. Nobody will prioritize you as much as you will prioritize yourself. Yes, it’s admirable to be nurturing towards others (a quality I don’t seem to possess), but take care of yourself first. When I’m leading groups in the wilderness, I’m mostly useless if I’m not well fed, hydrated, and rested. These seem like basic things, and they are. Do them. I’ve hiked close to 5,000 miles in the last ten years and would consider myself experienced when it comes to wilderness backpacking. But guess what? Mother Nature doesn’t give a f***. Every time I’m feeling a little cocky, something happens to remind me not to lose humility: a lightning strike close by, a hailstorm on a ridge line, getting somewhat lost in the Himalayas. I hear people talk about “conquering mountains”, but the reality is you’re lucky if Mother Nature lets you make your journey without throwing anything crazy your way. Good Things Come With Patience. In the wilderness there’s no such thing as instant gratification. If you want a pretty sunset or a mountaintop view, you have to work for it. Delicious backcountry meals have to be planned days in advance. You can take as many cool photos as you want, but without cell service there’s no gratification of instant likes. Furthermore, I usually spend months planning out my international wilderness trips, so patience is mandatory to have a successful hike. Laugh in the Face of Misfortune. Has anything in the entire history of long-distance hiking every gone smoothly for anyone at any point in time? For my last trip to Nepal, I spent months planning and doing research so I could be as prepared as possible. Upon arrival to Nepal, we couldn’t do the route we wanted due to no resupply points and winter weather. So we opted for a lower route. I’m not saying don’t prepare; I’m just saying be ready for nothing to go as planned. Being able to be flexible and find humor in tough situations has enabled me to keep hiking long term. I bring this lesson in to my regular life. In the last few weeks multiple things have broken on my car and my attitude is sort of Haha, of course my car is broke. I have no good fortune with technology or vehicles. Sharing intense experiences outside and struggling through adversity together makes for strong, deep relationships with those who are in the experience with you. My Nepal hiking partner @buckeybiesak likes to talk about how some people have a small amount of relationships that are a mile deep and others have a mile wide amount of shallow relationships. I think he’s a pretty wise dude. Be the person who has mile deep connections. This is so hard for me to actually do. I’m constantly day-dreaming about my next trip, worrying about what I’m going to do for my next job, planning out my to-do list, imagining made up scenarios in my head that will probably never actually happen. When my mind is constantly somewhere else, I’m missing out on the things that are actually happening in front of me. Thankfully I’m no longer that person who sits on my phone at dinner while there’s actual real humans in front of me. I am making some progress. And nowadays when I catch my mind wandering away from the present I remind myself to breathe and snap back to reality (as Eminem would say). The thing about wilderness backpacking is that you have to carry everything you need with you. There’s no room for superfluous luxuries; only survival gear. What do you actually need to get by? Shelter, food, water, clothes, and navigation equipment. Beyond just backpacking, I carry this over into my regular life as well. I choose not to spend money on things like new clothes, electronics, a nice car, or anything that drains me financially and ties me to a lifestyle that doesn’t make me happy.Instead I can spend my hard earned money on international trips and good times with loved ones. Check out my 7 Month Travel Budget for more info on how I achieve this. Share your own lessons that life has taught you in the comments below (even if they are not lessons from the wilderness, I’m always looking to learn). Goodbye Utah/ What Does a Wilderness Therapy Guide do? Something I learned in midlife (if you adopt it now you will be ahead of the pack) is that kindness matters. I just read that you don’t take care of others well. Make this a priority and start small. It will make your life more fulfilling and your soul more humble. You are quite a woman, adventurous, brave and smart. I have been following you pretty much from the beginning of your long hike blogs. I forward your blog posts to my daughter who is planning her first complete AT hike beginning in March, 2019. You are an inspiration to her. She is 32. Hi Annee, Thanks so much for your wise words and for following my journey. I agree that I could probably start to care for others better. I’ve had a lot of years of only having to take care of myself. I wish your daughter luck on her hike. Thanks, girl. I’m glad you’re out there reppin’ the side braid. I agree with your words and the previous comment. Hiking is praying with your feet and the most intense way of living. Given the adequate preparation you mentioned I urge future hikers to have some faith in the future. Your excellent book sure will help those being interested in the Himalayas. I Love your blog. I love that you call it praying with your feet. I couldn’t agree more. Thanks so much for your kind words. i am the real stefan.